Give a computer a task that can be crisply defined — win at chess, predict the weather — and the machine bests humans nearly every time. Yet when problems are nuanced or ambiguous, or require combining varied sources of information, computers are no match for human intelligence. Few challenges in computing loom larger than unraveling semantics, understanding the meaning of language. One reason is that the meaning of words and phrases hinges not only on their context, but also on background knowledge that humans learn over years, day after day. Since the start of the year, a team of researchers at Carnegie Mellon University — supported by grants from the Defense Advanced Research Projects Agency and Google, and tapping into a research supercomputing cluster provided by Yahoo — has been fine-tuning a computer system that is trying to master semantics by learning more like a human. Its beating hardware heart is a sleek, silver-gray computer — calculating 24 hours a day, seven days a week — that resides in a basement computer center at the university, in Pittsburgh. The computer was primed by the researchers with some basic knowledge in various categories and set loose on the Web with a mission to teach itself. “For all the advances in computer science, we still don’t have a computer that can learn as humans do, cumulatively, over the long term,” said the team’s leader, Tom M. Mitchell, a computer scientist and chairman of the machine learning department. NELL also learns facts that are relations between members of two categories. For example, Peyton Manning is a football player (category). The Indianapolis Colts is a football team (category). By scanning text patterns, NELL can infer with a high probability that Peyton Manning plays for the Indianapolis Colts — even if it has never read that Mr. Manning plays for the Colts. “Plays for” is a relation, and there are 280 kinds of relations. The number of categories and relations has more than doubled since earlier this year, and will steadily expand. The learned facts are continuously added to NELL’s growing database, which the researchers call a “knowledge base.” A larger pool of facts, Dr. Mitchell says, will help refine NELL’s learning algorithms so that it finds facts on the Web more accurately and more efficiently over time. Today, ever-faster computers, an explosion of Web data and improved software techniques are opening the door to rapid progress. Scientists at universities, government labs, Google, Microsoft, I.B.M. and elsewhere are pursuing breakthroughs, along somewhat different paths. Still, artificial intelligence experts agree that the Carnegie Mellon approach is innovative. Many semantic learning systems, they note, are more passive learners, largely hand-crafted by human programmers, while NELL is highly automated. “What’s exciting and significant about it is the continuous learning, as if NELL is exercising curiosity on its own, with little human help,” said Oren Etzioni, a computer scientist at the University of Washington, who leads a project called TextRunner, which reads the Web to extract facts. 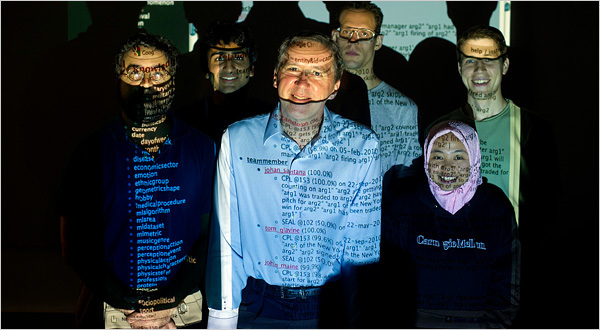 Computers that understand language, experts say, promise a big payoff someday. The potential applications range from smarter search (supplying natural-language answers to search queries, not just links to Web pages) to virtual personal assistants that can reply to questions in specific disciplines or activities like health, education, travel and shopping. With NELL, the researchers built a base of knowledge, seeding each kind of category or relation with 10 to 15 examples that are true. In the category for emotions, for example: “Anger is an emotion.” “Bliss is an emotion.” And about a dozen more. Datainspektionen-Skratta inte åt Ubicomp! Identifiera och lokalisera människor och apparater. Trådlöst. Överallt. Jämt. Statens Medicinsk­etiska Råd – Kan man och bör man förbättra minnet och människans förmåga att tolka och behandla informa­tion?